This page is here for the sole purpose of remembering the events that took place within our region, no right or wrong or judgements are being placed on any one group. looking back in hindsight and with reflection and not being het up in the heat of the moment as it was happening, we do look at things very differently and there was no reason to consider Germans who had made their homes here voluntarily as any differently as the indigenous population, but things just happened the way they did out of fear of the unknown rather than anything else with no proper reason. For the German people living in Britain it must have been a worrying time as the great war became a reality. As the war began a few incidents of violence and protests against the German members of the population rose up, though many were able to carry on with their daily lives as best as they could. A number of sanctions were imposed and they were always under the watchful eye of the authorities. Most German born people were removed from any government office jobs they held, and a number of businesses removed any German employees. They were asked not to use certain shops, restaurants and public buildings. Internment on the Isle of Man was the outcome for some. In Liverpool the German residents saw little opposition to them in the early months of the war, and although certain sanctions had been put in place, those not interned could go about their daily lives as normal. They had become part of the local communities, living and working here for many years, marrying into English families. Most of the Pork Butchers and Shoe Makers in Liverpool were German run, they had also set up the German Evangelical church along with the Duetscher Klub and Duetscher Liederkranz ( A Singing Society ). They were well respected in Liverpool. The sinking of the Lusitania was a major event of world war one. Many believe it was the first in a series of events, that would lead to the Americans joining the war. 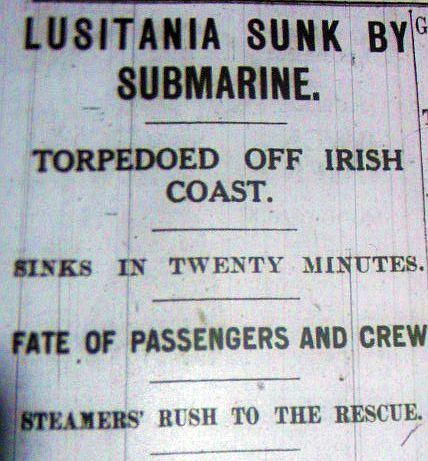 Lusitania is regarded as the second most famous ship to be lost at sea, after the Titanic. Much has been written about her sinking on 7th May 1915 off the coast of Ireland, when the German submarine U-20 fired a torpedo into her Hull. 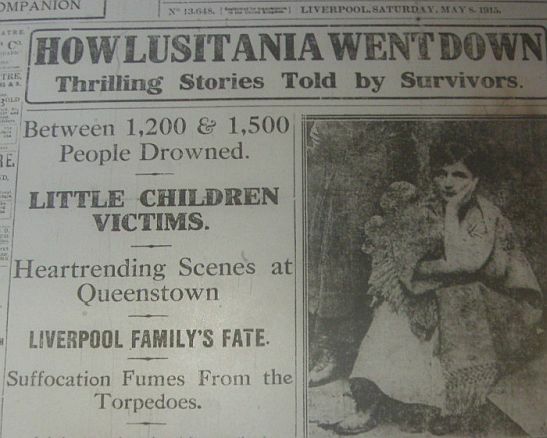 Lusitania sank within 18 minutes, the loss of life was of a terrible scale. 1,198 people died (785 passengers and 413 crew). Many of the crew were from Liverpool, the majority from the close knit Liverpool Irish communities in the North end of the city. For them it was total devastation with so many of their men lost. Our Lady of Reconciliation Church in Eldon street has a WW1 memorial that names 10 men who died in the sinking of Lusitania, a further 10 men from the nearby area also perished. 20 men from a few streets, this was the story throughout much of the North end of Liverpool. Reports suggest that the first signs of trouble came from family and friends of the dead sailors. Riots then broke out across Liverpool and spread not just through Britain but to other cities across the world. Such was the impact of Lusitania. From various sources including the internet and old newspapers I have been able to write a small account about what was happening during the May 1915 Anti German riots, also known as The Lusitania riots. I must thank all those who have helped me discover some of the details below, without their help this page would not have been possible. So little is recorded about these riots, and we should never forget the events that happened back then. The North end of Liverpool saw the first signs of violence. Attacks took place at Mr Fischer's store on Walton Lane. The shop windows were smashed and food was thrown into the street. Dimler's store on County road was also Attacked. The police arrived and struggled to gain control before forcing the crowd into Spellow station on County road where they ransacked three more shops. Around 60 officers tried to clear the crowd which had now risen in size. As it was moved the crowd targeted Deeg's shop on Fountains road, pulling the shutters from the shop and throwing them into the road before destroying the front of the store. On Robson street a Pork Butcher shop was attacked and 19 people were arrested. Calm was restored with no more major incidents reported. The disturbances continued. Dimler's on County road was again set up. Fox Street, Juvenal Street, Mile End, Heyworth Street and Richmond Row all saw violence as businesses were attacked. A Pork Butchers shop on Scotland Road was vandalised and completely looted of all its contents. Public houses across Liverpool were ordered to close their doors by 6pm, while Wallasey made it pubs close by 2pm. By the end of the weekend the Police had made 67 arrest with most of the trouble occuring in the North end of Liverpool though smaller incidents were reported across the city. The violence grew to a serious level across the city as Men, Women and Children were reported as taking parts in the attacks. German Pork Butcher shops had been the target over the weekend but now any Butcher shop was being hit along with any shop that was or appeared to be run by German people. The North end of Liverpool again saw trouble. Deeg's on Fountains Road was again set upon and lost what remained of its windows. The trouble moved to the South end of Liverpool where a crowd estimated as over 2000 made for the Pork shops along Mill Street, Northumberland Street, Winsor Street, North Hill Street, Upper Hill Street, Warwick Street, St James Street, Lodge Lane and Crown Street. 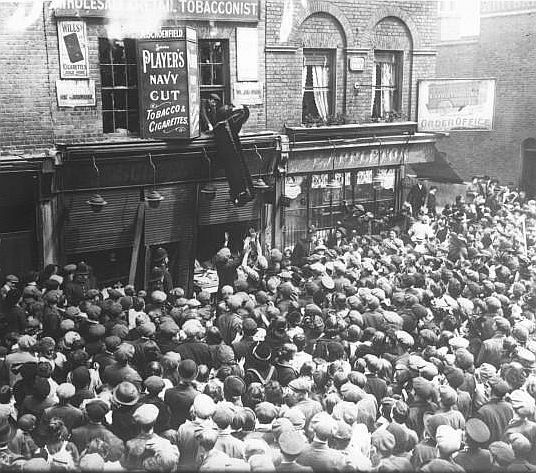 Police had being posted on guard outside many shops but they had little chance of stopping the huge crowd who smashed windows and looted the contents of the stores. Violence flared in Paddington while Yaag's Butchers on Great George Street was set upon. The trouble spread to Bootle, Birkenhead and Seacombe. A fountain pen factory at Seacombe came under attack as it was believed it was being run by a German, the police struggled with the crowd who had come to attack the premises but eventually they regained order, though not before much damage was done. A Pork Shop in Birkenhead was ransacked and the furniture from the home above the store was thrown into the street and set on fire. The Police were using all their resorces with Special Constables being transported around to the worst trouble hit areas. They were using everything they had and although some reports suggest that at first they were turning a blind eye to attacks on German run shops it does seem that in fact they were trying to do all that they could to stem the violence. They were at their limited and during the day the Chief Constable of Liverpool had been in contact with the Home Office with a request for help from the military. This was granted but the troops never came onto the streets. The 67 peope who were arrested over the weekend appeared at the Magistrates Courts in Dale Street with those found guilty being remanded for 7 days. The Judge said that although he could understand that the first news of the Lusitania sinking affected everybody he rejected it as a justification of the riots. He als warned that future rioters would be dealt with in a much more harsh manner. The attacks although starting to ease off were still taking place. A crowd tried to march in the suburbs of Wallasey but were stopped and turned back by a police cordon at Wexford Road. After Liverpool the riots spread to Manchester then to all parts of Britain. 45 more people came before the judge at Dale street and he carried out his threat from the previous day by jailing the guilty to between 21 to 28 days. He also noted the number of men who appeared of Military age and suggested that if they wanted to fight the Germans then they should do it in a military uniform. Other courts across the city also dealt with the rioters and those found guilty were given custodial sentences. A lot of people who came before the magistrates had claimed they had acted in revenge of their own people aboard Lusitania. She was a registered Liverpool ship and they considered her one of their own affectionately calling her ' Our Lucy '. None of those charged had a relative serving on the ship. One man who was brought before the judge at Dale Street said that he had served aboard Lusitania a few months earlier and was acting in revenge towards the sinking of his ship. It was proved that he had never served aboard the ship and was using the sinking as a lame mask against his crimes. Attacks on non German people would not be tolerated by the courts. One man who had thrown a stone into a Scandanavian shop was ordered to pay compensation of 30 shillings and called a coward. A woman was imprisoned for 28 days for being drunk and violent and recieved another 58 days for breaking the windows of a Russian run shop. The Britannia Hotel, 283 Breck Road, with the corner of Coniston Street in Liverpool. Seen here after an attack. Pictured below as it looks in 2013, notice the street sign for Coniston street is the same one in both photographs. The 1910 Gore’s Directory has Charles C. Bobbie as the licensee of the Britannia Hotel. Census returns show he was born Charles Claus Bobbe in 1868, in Liverpool. His parents were Christopher and Mary Bobbe, both from Germany. Charles grew up in the Scotland road area of Liverpool and ran a pub on Great homer Street, before moving to Anfield. He married Margaretha Dorathea Schumacher in liverpool in 1891, Dora as she was known was born in germany. They stayed in the area until their deaths. Charles 1933, Dora 1927. In 1918 their son Christopher Frederick was serving with the British Army as Rifleman 376063, London Regiment (Post Office Rifles) As the war drew to its ending, Christopher found himself on the Somme Region of Northern France, Sadly while fighting here with his regiment on 28 June 1918, Christopher was killed in action, he was just 18 years old. He is buried at Franvillers Communal cemetery Extension. 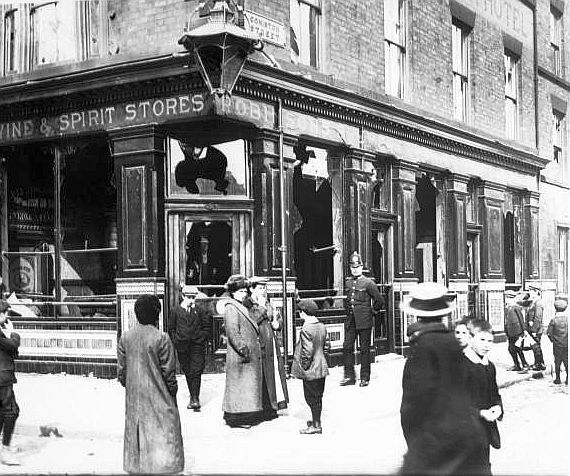 In 1915 Charles and Dora had witnessed the smashing of their public house on Breck Road, during the Anti German Riots. In 1918 they received the dreadful news that their son had died while fighting for the British Army against the German Army. On the same block three doors away at 277 Breck Road was Conrad's Pork Butcher shop, run by George Conrad, this was also raided in the attack. Local man Charles William Hogg who was 18 at the time, remembered the 1915 May riots stemming from the sinking of the Lusitania in Liverpool. He witnessed the attack on the Conrad Premises at 277 Breck Road and how a grand piano was pushed out of an upstairs window. Nearly all the German Pork Butchers were attacked and also Germans following other trades like Charles Bobbe and family who were Pub licensees at the Britania . At this time Charles Hogg's Grandmother took the Bobbe children to stay in their home. The Stanley Pork shop at 416 Prescot Road, Stanley, Liverpool, located between Gidlow road and Herrick street, and close to St Anne's church. The lady in the doorway is Frances Isabella Redmond who ran the shop. It is not known if the shop was attacked during the 1915 riots, the Redmond family had no connection to Germany apart from a man they employed named Charles Keitel. The 1911 census has Charles Keitel ( born Germany ) living with the Redmond family above the Butcher shop at 416 Prescot Road, Stanley, Liverpool. Also here are Frances Isabella Redmond 45, and her three sons Lawrence 17, John 16 and Walter 12, all working for the business. Lawrence Redmond joined the King's Liverpool Regiment in December 1914, but he became very ill during service and was discharged unfit in June 1916. He returned home to Liverpool, probably being nursed by his mother, but sadly he passed away within a year. So what happened to Charles Keitel at the outbreak of war if he was a man born in Germany. With the help of others I have found a few details for him. August the 4th 1912 Charles married Lena Conrad at St Saviour's church in Breckfield Road. They are both living at Lena's parents home 277 Breck Road in Liverpool. Charles is still a Pork Butcher and so is Lena's father George, Lena's mother is also called Lena. So Charles is moving in the circles of his profession. Charle's father is listed as Michael, a Tanner by trade, and Lawrence Redmond ( Soldier listed above ) is listed as a witness to the marriage meaning Charles and Lawrence must have been good friends. I do wonder if they are the two young men in the photo above? But we have no way of telling. In 1913 a son is born to the couple named Charles C Keitel. We know that Charles had moved into the home of his new wife Lena by 1912 at 277 Breck Road, the same shop listed above, that was attacked in the riots, was this enough for them to move from the area? After this nothing can be found, what happened to them we can only guess. He could easily have changed his name to something like Kettle or Keats so as to avoid the growing anger towards German people living here. Then of course he is part of the Pork Butcher profession and they may have helped him change his name completely or help him and his family move away to a area were nobody would have known that Charles was born in Germany. He may have been intered by the British as an alien. This is all assumption and we can only guess. Hopefully one day details will turn up of just what happened to the family. A Frederick Michael Keitel from Germany,a resident in Rothwell Yorkshire ,was given his naturalisation certificate in 1908. On died 26th December 1937 Frederick died at of Commercial Road Rothwell Yorkshire. Probate of £12249 5s 11d was granted in London to. John Edward Graves General dealer and Christian Rhon pork butcher. In 1901 at 88 Commercial Street, Rothwell, Yorkshire. Frederick is listed as a Shopkeeper/Pork Butcher. Born Kroffenbach,Germany. Also living at the addres is 17 year old Christian Rohn, an apprentice Pork Butcher, born Zimmern, Germany. A marriage from 1932 in Wakefield list John E Graves and Alice Keitel. Is there a connection between Charles Keitel in Liverpool and Frederick Keitel in Yorkshire? They were both born in Germany, they were both Pork Butchers, it is very possible that they were also related. 142 Smithdown Road, with the corner of Arundel Avenue. Scene of an attack during the riots. From the Liverpool Echo, 11 May 1915.
" A large pork shop at the corner of Smithdown Road and Arundel Avenue had been absolutely wrecked. All the windows had been smashed and the stock commandeered or thrown into the street. Women hurled strings of sausages at one another and one women in a neighbouring street went down on her knees and scrubbed the pavement with a joint of pork. Other women went home with their aprons full of pork and bacon. After sacking shops, the invaders went into the living room upstairs and spread destruction everywhere. The piano was splintered to matchwood and hurled into the street. A man came to the gaping hole where the front window had been and, waving a handsome mirror over his head, smashed it to fragments against the stone still amid cheers from the crowd below. " Another report from a 14 year old boy living in the area gives the same information as above, he also recalls that the family had hid in their wardrobe as they tried to protect themselves. In 1906 and 1911 a Henry Rutsch is listed as operating a Pork Butcher shop from these premises. In 1916 he is listed at the address, so it was he and his family that came under attack during the riots. How much it affected him can be seen below. The London Gazette, dated 11 February 1916, states that " Henry Rudge, heretofore and known by the name of Henry Rutsch, of 142 Smithdown Road, Liverpool, Pork Butcher, herby give public notice. that on the 19th day of January 1916, I formally and absolutely renounced, relinquished and abandoned the use of my said surname RUTSCH and then assumed and adopted and thenceforth on all occasions whatsoever to use and subscribe the name Henry Rudge instead." Henry's signature on the census return. 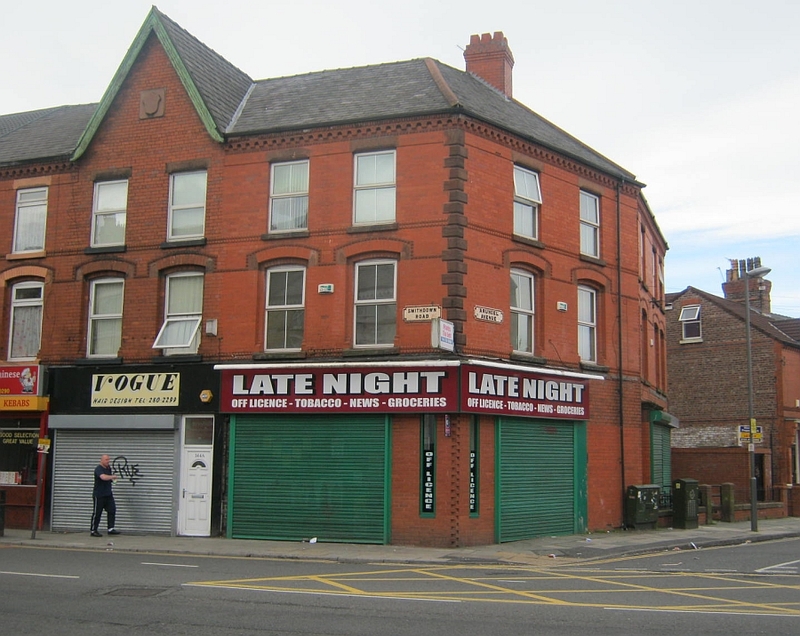 In the 1911 census Henry is listed as a Pork Butcher, living with his family at 142 Smithdown Road, the building is described as having 10 rooms. Henry was born in Germany in 1867. In 1902 he married Bertha Baier in Liverpool, Bertha had been born in Liverpool in 1869 to German parents, her mother Katherine was living with the family at Smithdown road in 1911 aged 65. Henry and Bertha had at least 5 children, Elsie Elfrida born 1896, Olive Rose 1901 and Oscar Herbert 1905 are known. The census return notes 5 children, 4 living, 1 died. Birth records show 10 children born in Liverpool in the timeframe called Rutsch ( spelling is changing T and S reversing ) The census return signature above gives the correct spelling as RUTSCH. Also listed as living with the family are 3 servants. Susan Kussella 22, Bertha Pilling 21 and Arthur Malone 25. They list 200 establishments as having been gutted. Liverpool city council recieved 563 compensation claims in the weeks following the riots. Later the council would refuse to pay compensation to any Alien Enemy who had had their property damaged. Photo from the Liverpool Daily Post and Mercury 11th May 1915. Showing a crowd around a German shop on Scotland Road. It is worth noting that as the riots in Liverpool carried on the anger of the crowds turned from just being anti German to anti alien. Scandanavian, Italian, Chinese and Russian businesses were targeted. After the shops they attacked homes. Throughout all of this there is evidence that people were still willing to help and protect members of their communities who had fallen victim to the anger of the crowds. 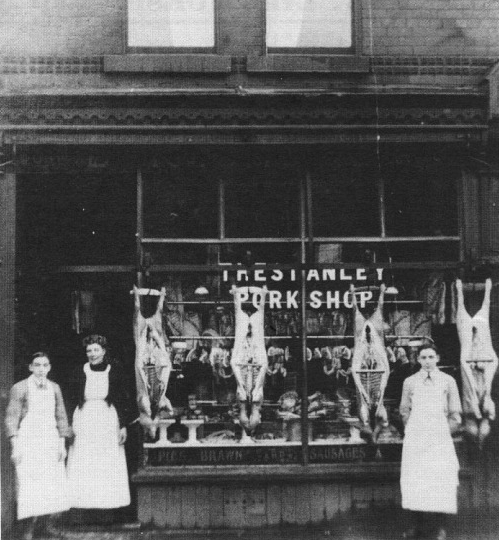 At the start of WW1 75% of the Pork Butcher shops in Liverpool were run by German families, at the end of the war it was believed that there were no German butchers remaining. Many had been rounded up along with other Germans working and living here and sent to camps on the Isle of Man, later many were returned to Germany. Others we know were helped by friends from the communities that they had become such a part of. One man of German birth who had had his store damaged presented himself at a city centre insurance firm to seek compensation. As he was about to enter the insurance building a woman recognised him and shouted to onlookers that he was a German. The man had to hide inside the building while the police guarded the doors and dispersed the crowd who had gathered. The Dimler family who ran a number of Pork Butcher shops in the Liverpool area had two sons George and Charles serving in the British Army during WW1. After the war they managed to re-opened one of their butcher shops on Stanley Road, near Marsh Lane but renamed the shop Allenby's, using the surname of the hero of the middle east/Palestine campaign: General Allenby. The shop with that name managed to survive as a pork butchers into the middle of the 1970's. You can read about the Dimler family on the link above. Lord Derby had suggested during the Liverpool riots that as so many people wanted to avenge the Lusitania and fight the Germans, that a Lusitania Battalion could be formed if enough volunteers came forward. The battalion could then be used to support the King's Liverpool Regiment. The Lusitania Battalion never happened. Suspicion fell upon the British monarchy and King George V was persuaded to change his German name of Saxe-Coburg and Gotha to Windsor, relinquish all German titles and styles on behalf of his relatives who were British subjects. The German Shepherd breed of dog was renamed to the euphemistic "Alsatian" the English Kennel Club only re-authorised the use of 'German Shepherd' as an official name in 1977...... Its almost laughable. After a couple of days of riots in Liverpool anyone German was rounded up for internment, many for their own saftey. Homes began recieving early morning calls as people were taken away, often in handcuffs. At first most were housed in the main bridewell, but it became over crowded very quickly. It was then decided to move everyone to a camps at Hawick in Scotland. Trains where laid on at Lime Street station and although large crowds had gathered to watch them depart, no anger was directed towards them. Sometimes the aurthorities who called looking for young men of German birth were greeting to the phrase ' He is serving in the British Army ' Many men were serving in the Army having changed their German surnames to something more British, their loyalty to Britain can never be questioned. In WW2 similar stories would unfold as the authorities searched for young Italian men only to find again that they were serving for the British Forces. The Isle of Man housed two internment camps during WW1 at Douglas and Knockaloe near Peel. The Douglas Camp was a former holiday camp while Knockaloe had been purpose built using prefabricated huts and even had its own railway link. They held a large number of Germans over a five year period before the camps finally closed in 1919. Many of the Liverpool Germans would have been held on the Isle of Man where over 200 of the interned died. Many of the men held were married to British woman and this caused them much worry as to how their families would survive with the bread winner taken away. After the war many were returned to Germany and had to fight to get back to Britain, some never made it back. A rather harsh way to treat them when the war was done as their homes where after all in Britain. The press focused on the bodies of helpless children, O'Mara writes that his neighbours recalled the strapping maritime labourers who had cheerfully left home only days before. This loss of men like Joe Manassi, Harold May, and Alfred Gilroy who were friends of to the O'Mara family and sons of their neighbours, was felt with excruciating grief. "Listen to all them women crying!," commented Freddie to Pat, "with whitened face." The desire for revenge emerged as an overpowering emotion, among old women as much as among young toughs like O'Mara and his friends.
" 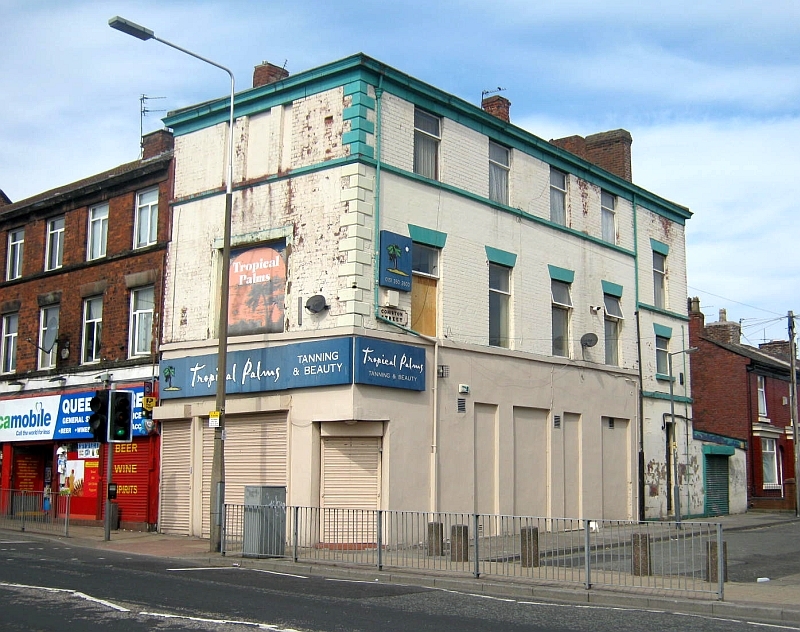 On the corner of Scotland Road ominous gangs were gathering, men and women, very drunk and very angry," wrote O'Mara. " Suddenly something crashed up the road near Ben Johnson Street. A pork butcher's had had its front window knocked in with a brick and a crowd of men and women were wrecking the place. A little further up the same thing was happening, everything suggestive of Germany was being smashed to pieces. The crowds went along Scotland Road, Some cutting into Sawney Pope Street, others going into Ben johnson Street, Clear down to Byron Street. Everyone had a brick or stick or something tucked under his or her coat or apron and there was much pilfering." Pat and his friend Freddie lived in the South end of Liverpool and excited by the riots decided to take the tram back to their own area to see what was unfolding. 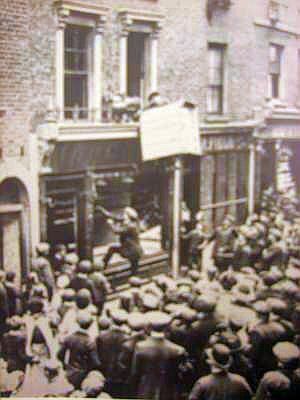 Charlie Beech's Pork Shop opposite St Vincent's church on St James Street was already under attack when they arrived. " Mr Beech had been living in Liverpool thirty odd years, but there was a faint suspicion that years ago he had changed his name. His big shop was in shambles when we got to it, Mr Beech and his son had made their escape " The crowd then moved onto Yaag's store in Great George Street. "Joan of Arc" (a female chip-chopper by the name of Mrs. Seymour) led the mob on a rampage that rarely spared kith or kin. "Mr. Yaag was a big wholesome fellow allegedly born in Germany," recalled O'Mara of a butcher he knew in Great George Street. " Two of his nephews at the time were with my cousin Berny and the Eighth Irish over in France. I always liked Mr. Yaag, but not quite so keenly as I liked to break his window without fear of molestation." The utter surprise of some of the victims is evident. "As we converged on the big shop, Mr. Yaag, arms akimbo came out, pipe in mouth and with his usual broad smile, this vanished instantly as someone kicked him in the belly and a volley of bricks sent in the huge windows. ' You'll sink the bleedin' " Lucy " will you!" Yelled our Joan, waving a shillalah over his prostrate form. Yaag's Store after the attack. Cook's Pork Butchers in Mill Street came next. " Mr Cook knew as much about Germany at the time, I think, as I did. Later it was proved that he was from Yorkshire stock. But he had a Pork Butcher shop, and as Pork and Germany were identical terms, we left his shop in a shambles "
After the shops it was the homes of Germans that the crowd vented their anger upon. O'Mara explains how they identified their victims. " It worked something like this. The mob would pause panting for a moment and someone would address Joan of Arc ' You know that dirty old man that lives in such and such a street, I think he is one of them ' Someone who did not like this particular person would agree and off we would gallop. On and on it went. Up in the North end it was the same, many mistakes were made." An elderly couple who who lived in Kent Street who had lived in Liverpool so long they looked like natives, and had taken out naturalization papers, were attacked while singing Lutheran hymns at home in their parlour. And Annie Monnigan, the Irish wife of an interned German sailor was in her ' Shack ' surrounded by her six small children when she was attacked. " I shall never forget the hysteria of this last debacle," wrote O'Mara, " with the six young children screaming and Annie, like a good colleen, fighting back and asking no quarter." While the old couple were German by birth and English by law, Annie Monnigan was Irish by birth and through marriage a German by law. Crowds frequently showed an awareness of such distinctions like with Sarah Doran, the popular Irish wife of a German boarding house owner who "always helped the church" and was not targeted. The council later offered to rebuild the small shack for Annie Monnigan and her six children, she caused such a fuss that they agreed to give her a cash settlement. Joan of Arc ( Mrs Seymour ) lost her Chip-chopping job and recieved 6 months in Walton for her involvement. It is interested to read in the book that Pat O'Mara was involved in an attack that night on the home of his own aunt who had married a german Man. His friend and fellow rioter Freddie Seegar was the son of a German father ( then deceased ) O'Mara's recollections are of vital importance when you consider that hardly a trace of events of the Liverpool anti German/Lusitania riots are recorded. The two Liver Building Birds - a cross between an Eagle and a Cormorant - were designed by a German sculptor, Carl ( Karl ) Bernard Bartels, a wood carver and resident from the Black Forest,who had come to live in England in 1877 and took British nationality. Bartels won a competition for this job and created the magnificent design we see today, two 18ft high copper sculptures completed in 1911. When the Great War broke out Bartels was arrested as a German citizen and imprisoned on the Isle of Man as panic over enemy aliens ran rife. Worse still, he was forcibly repatriated at at the end of the war, despite having a wife in London. In the end he did return to England, though it took him many years. He lived in England until his death in 1955. During WW2 he had used his skills to produce artificial limbs. The City of Liverpool removed all references of his achievement from the record books. It would appear that they did not want it known that the ' Liver Bird' one of Liverpool's proudest symbols, was created by a German. It would take the city over 90 years to recognise and give Carl the honour that he so justly deserved. My family on my fathers side, like most Liverpool people, are of Irish Ancestry. In 1915 they were living in the Scotland Road area in the North end of Liverpool. They were from the heart of the community where most of the Lusitania crew came from, and of course where the uprisings began. I may have ancestors who took part in the riots or helped protect friends. There is little doubt that they would have witnessed attacks or the aftermath of them. My Mothers side of the family were from Sweden and were living in the South end of the city. In 1915 they ran a cake shop in the Dingle. I have no idea if their shop or they themselves ( being Scandanavian ) were ever a target of the riots. The Tobacconist's shop in the photo belonged to Adolph Shoenfeld, who was a German Jewish immigrant who arrived in London in about the 1860/70's, He had 5 children.They were given shelter by their neighbours after it happened and the family changed their name to Sheffield as a direct result of this incident. Their son Adolph served with the British Army during WW1.